Rev Andrew Sarle said he was pleased to take part in the opening ceremony of the Abbotshaugh Footbridge, which provides an important link between the Bainsford, Langlees, Carron and Carronshore communities. Rev Andrew Sarle. Lisa Evans. The Clerk to Falkirk Presbytery adapted the words used by former Moderator of the General Assembly, Very Rev Dr Derek Browning, to bless the Queensferry Crossing in the presence of Her Majesty the Queen last September. Mr Sarle also poured a flask of water from the River Jordan, which flows from the Sea of Galilee and on to the Dead Sea in the Middle East, into the River Carron from the middle of the bright green, 157-foot bridge. He said: “It was something of a surprise to me that I got a request last week to ‘come and bless our new bridge’. “I thought that the words Very Rev Derek Browning used for the Queensferry Crossing blessing were excellent so I adapted them to fit this somewhat smaller, but nonetheless impressive, footbridge. “To me, bridges are a great sign of hope, of enabling people to come together. 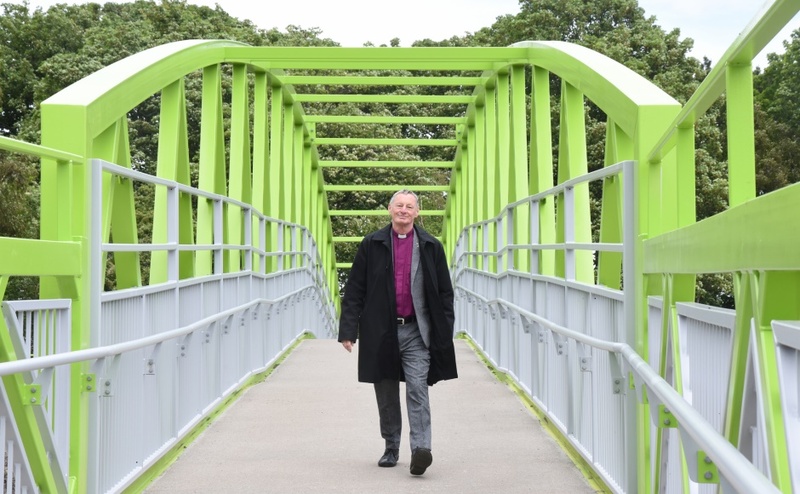 Mr Sarle, a Local Ordained Minister at Bainsford Parish Church in Falkirk, blessed the 27 tonne bridge, which is open to pedestrians and cyclists, on Tuesday. Dr Browning was Moderator in 2017-18 and said blessing the Queensferry Crossing, which spans the Firth of Forth and connects Fife to Lothian was one of the highlights of his year. He said: “It’s always flattering and humbling to have someone use your work and it is good that words are said at these moments of new beginning.